Here’s the Paulding County GA Real Estate Sales Report for December 2018. 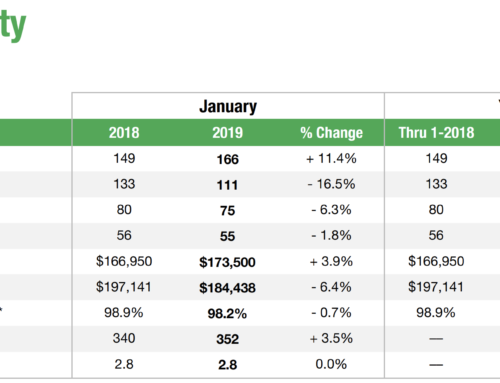 This report gives detailed real estate market data for Paulding County in December 2018. The December 2018 real estate market in Paulding County was slower than cold molasses. It’s quite common for most real estate markets across the US to slow down increasingly in the last quarter of the year, with the slowest month being December. Between the holidays and the inclement weather, there just aren’t as many buyers interested in trying to move during this time of the year. However, December 2018 was slower than expected. The number of new listings was down 72%, the number of pending sales was down 76.9%, and the number of closed sales was down a whopping 92.6%! This greatly reduced activity left the Paulding County real estate inventory nearly unchanged; the months supply of inventory remained the same (2.3 months), while the total inventory of homes for sale increased by an incremental 2.1%. The sales price data shows small increases as well; the median sales price increased by 2.7% to $196,750, and the average sales price increased by 2.5% to $210,670. With such a small number of transactions contributing to this data, it’s likely that these numbers aren’t a very accurate representation of Paulding County’s real estate market as a whole. But Spring’s right around the corner and is typically full of home buyers, so if you’re thinking of selling your home in 2019, now is the time to get the process started! There’s even more interesting details in the full report. To view the full December 2018 real estate sales report for Paulding County, GA, just click here. Call us today if you have a question about this report or are thinking of selling or buying a home in Paulding County, GA. And, if you’d like to have a market report for a different county, we’d be glad to provide it.